My husband and I were walking through target the other day and I stopped at an end aisle admiring the shelves full of Ball Mason Jars. "We don't need any more mason jars"
to which I replied "You can never have too many mason jars". Using glass to drink, eat, and store things in is a crucial part of healthy living, in my opinion. Many of the plastic items you use on a daily basis have harmful BPA chemicals within them, which can in turn, mess up your hormonal imbalances, effect your brain, and much much more (more information). While there are BPA free products, you need to research them because they are sometimes just as bad as the ones with BPA(source). So why is glass better?? Well, there are a number of reasons but the top reason is this. 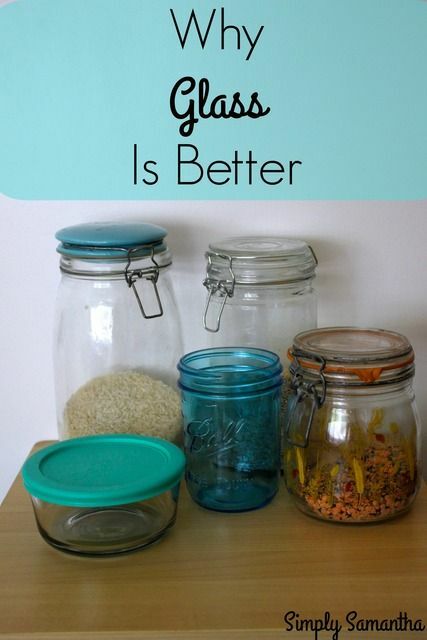 Glass Containers are not made with harmful chemicals that can make there way into your food. While those plastic containers are handy, they are laced with harmful chemicals. Glass is not. I don't know about you but I'd prefer to not have harmful chemicals in my food. I love this infographic that Lakewood Juice posted a week ago. They use glass for all of their products which I think is amazing! I wish more companies would do the same. Now you are probably thinking. Well, where to start is up to you. I'd say your best best is to start with storage and drinking glasses and go from there. Mason Jars are great for drinking AND storage. I find good deals on Mason Jars at the store. Just keep an eye out. Also I find stores like Big Lot's and TJ Maxx have great deals on glass storage containers. I've been buying mine over time with I have the extra cash or I find a good deal. I found some good deals on amazon, I might have to buy some more glass soon! Is glass more expensive? Yes and no. If you buy it all at once than yes, but don't feel like you have to rush. I'm doing it when I can and when I have the money. I know when I see a good deal and I take advantage of it. Keep your eyes open and start building that glass collection. The good thing about glass containers is that they last forever. No fading or food stains. I still have some plastic containers and I'm in the hunt for some good stainless steel or glass coffee travel mugs. I'm enjoying the challenge of switching to glass. Glass is becoming my best friend and I hope it becomes your best friend too!